china clay, ball clay, geology, ceramics and dorset! Yesterday I had a very interesting conversation with a Geologist on the effects of geology on clay and raw materials used in glazes. I went home and did some further research on one part of our conversation linked to Dorset and I thought it might interest you. 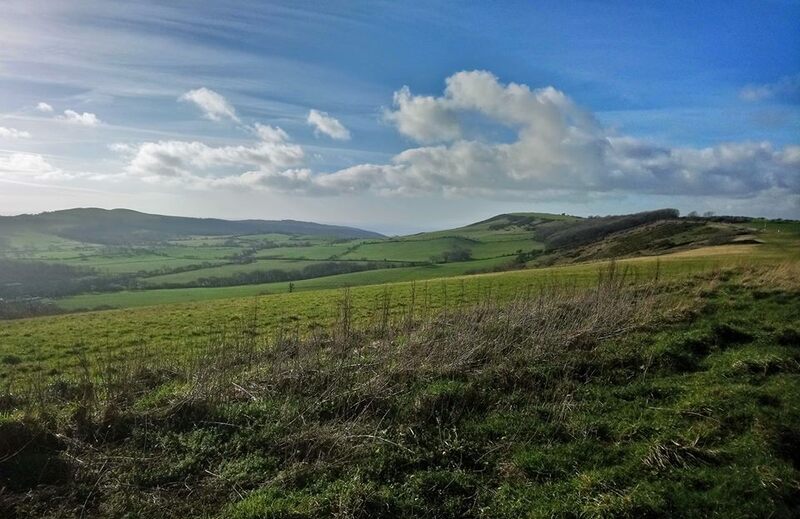 Whats the difference between China Clay and Ball Clay and why have we got Ball Clay in Dorset? China Clay (Kaolin) is formed by the decomposition of minerals particularly Feldspar which is the main ingredient in a rock called Granite. This is not a quick process and it happened millions of years ago between the late Cretaceous and early Paleogene periods. I had not heard of the Paleogene period, according to the National Geographic website it follows the Cretaceous period. Dinosaurs had gone and mammals were becoming more diverse. China Clay is found in Cornwall and parts of Devon. China Clay is only found in a small amount of places across the world. One County along in Dorset we do not have China Clay we have a very good quality Ball Clay. Why? Now it gets interesting and I am sorry but I am going to get a bit more technical. Ball Clay is a Kaolin that has been transported by water from its primary decomposed rock, which is usually Granite. So to put it simply the China Clay was created millions of years ago in Cornwall and Devon then vast rivers picked some up and carried it into Dorset. When this happened the Kaolin picked up impurities and was ground down on it's travels into smaller particles. This Kaolin on the move settled in Dorset and became Ball Clay. Ball Clay mainly consists of Kaolinite, Mica and Quartz. It has a higher plasticity to China Clay due to the ground down smaller particles. It contains a larger amounts of Silica and still has a whitish colour when fired. The majority of Ball Clay in Dorset can be found on the Isle of Purbeck, the Wareham Basin. Evidence of the mining of the Ball Clay can be seen at the Blue Pool tourist attraction. In ceramics both China Clay and Ball Clay are used as ingredients to make clay bodies, but they are very different ingredients. Ball Clay has a very high plasticity and excessive shrinkage. It is used to make clay easier to work with, giving the clay body it's plasticity. China Clay is used for it's whiteness and purity, but it has very poor plasticity making it difficult to work with. China Clay is well known for it's use in Bone China and Porcelain. This whole research came about from a conversation discussing the fact that clays and glazes can be effected by a broad range of things from the type of wood that is used in a kiln firing and the rates of temperature change in a firing to the particular place a raw material was dug from. What happened to a raw material in the millions of years before it was dug and refined can have a huge effect on how it reacts in a glaze. A prime example of this was listening to Kate Malone at Ceramic Art London talk about her Saville Row project. Enough materials to mix the glaze for the whole project had to be purchased in one go as the whole glaze would change if one of the ingredients was dug from somewhere else in the world to the original glaze test ingredients. Savile Row is an amazing architectural and ceramic project, more information can be found here. I have tried to write this as simply as possible so you can gain a basic understanding . If you found this interesting and would like to explore this further you may like to visit Purbeck Mineral and Mining Museum at Norden, Dorset (please check opening hours) or visit Blue Pool. It has a small museum showing early history of clay mining in Dorset and the pool is set in a deep clay bowl. If you would like to travel further afield I recommend visiting Wheal Martyn Clay Works at St Austell. It is an interactive museum including a fully preserved Victorian China Clay works. If you would like to find out more about the geology in the South West I recommend having a chat with one of the members of the Jurassic Coast Trust. They have a wealth of Knowledge and information. For history on Dorset Potteries and clay mining do visit the Dorset History Centre. They even have Poole Pottery glaze recipe books! I enclose links to all these at the bottom of this blog. Finally while researching this I found a snippet of local clay history about Brownsea Island Clay on the National Trust website. In the 19th Century Colonel Waugh bought Brownsea Island and thought they had discovered a high quality of Ball clay similar to that at Furzebrook. A three storey pottery and a tramway to transport the clay from the pit was built. Unfortunately the Ball Clay was a poor quality and only suitable for making sanitary ware. 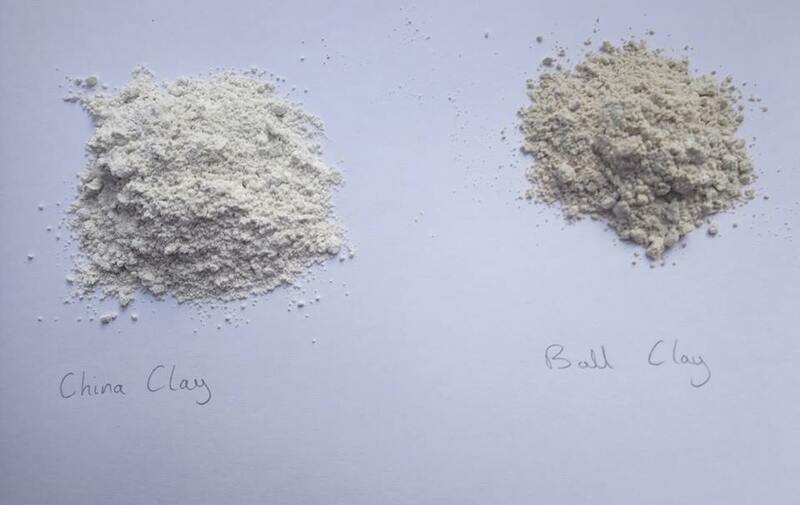 It just shows that Kaolin moving only slightly further from where the ball clay is mined in Dorset can have a huge effect on the properties and qualities of the material. Clay, isn't it fantastic. It can make something functional or sculptural, tell a story of past civilisations through Archaeology, link in with geology showing what can happen over millions of years, show chemical reactions through glazes and be good for our well being! In August 2018 I got the keys for my new studio. For any of you that have met me you will know I had been looking for a new studio space for over 2 years. After searching a wide area my studio happens to be a beautiful 6 minute commute through Puddletown forest. 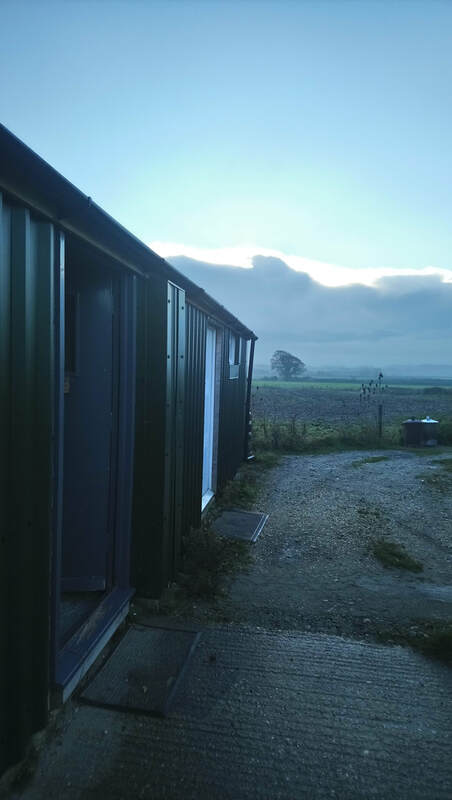 ​The studio is amongst a range of outbuildings that have been converted into workshops. That open grey door is my studio. The view in the background stretches for miles. A continuously changing and colourful farming landscape. I am amongst a range of friendly businesses consisting of a pie maker, iron worker, stone carvers-Stone Form Design, bath restorers and Dorset Coffee Company. An aroma of roasting coffee beans fills the air. 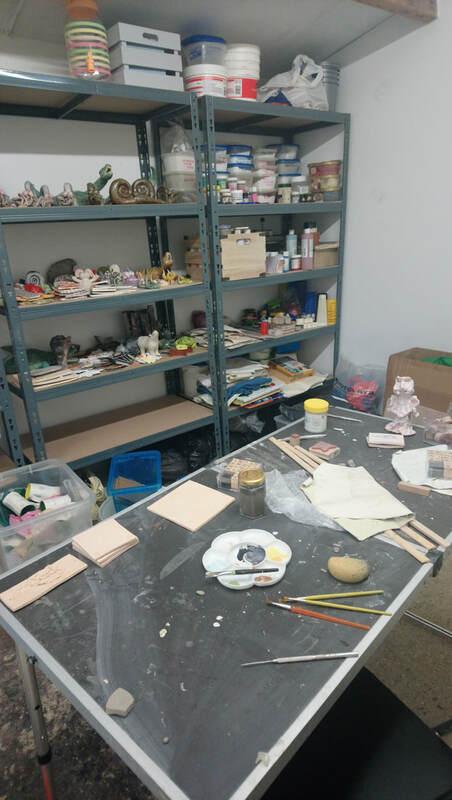 This week an artist has also moved into a spacious workshop. During August I built shelving systems and started to unpack boxes of ceramic resources and my own sculptures. It was the ideal time to move as I mainly run air drying workshops for tourist venues during the school holidays. At the beginning of September my kiln moved in. 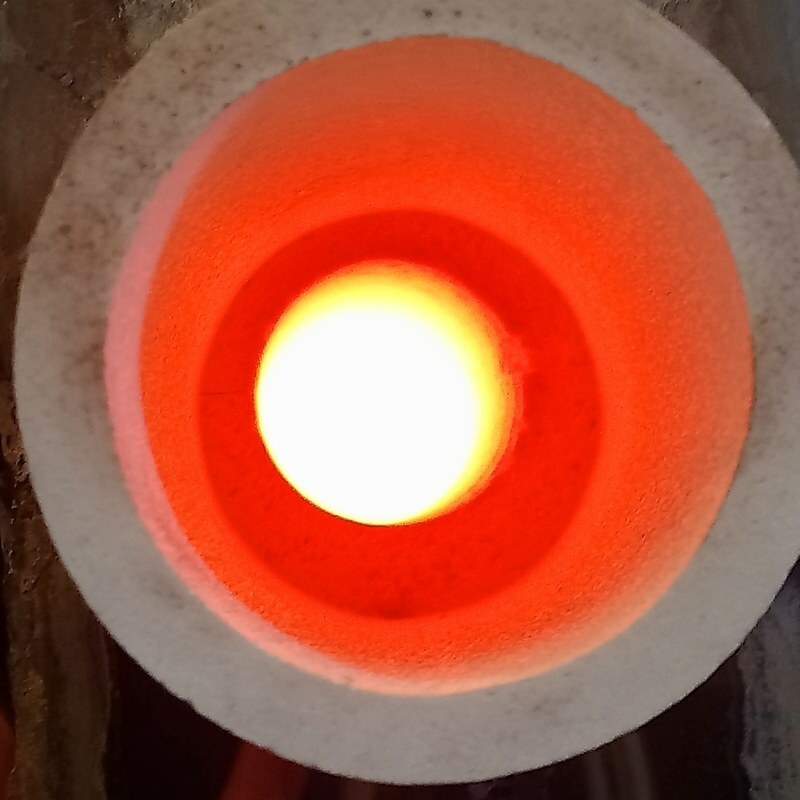 This is an image through the spy hole of my kiln. That white light in the centre is the heat as it is over 800 degrees in the kiln cooling down after a firing. The image on the right is of a section of the studio with my newly built shelves. It is getting organised with a shelf for glaze ingredients, two for stamps and textures. There is a shelf of workshop samples, space for my own work plenty of shelves for your work. These are at present full as it nears Christmas. The kiln is in another corner and I have a little kitchenette with a sink for washing equipment. It also holds the vital elements of any studio. ( A kettle and a radio) I am currently looking for a permanent table in the centre to create my own work on. I am looking forward to new possibilities, space to work on my own ceramics and develop ideas. I am starting to develop workshops for next year. I am thinking of what can be achieved in the future. I am looking at building more shelves! Watch this space. 2019 is looking at being an exciting year. Have you got a favourite jewellery maker, potter or independent restaurant that you love? You may only treat yourself once or twice a year to one of their fabulous products but wish you could support them more. Well you can, and it only costs your time. Below are three simple ways you can help. Take 10 minutes a week or even a month to show your support. 1. Write a positive review. There are an enormous amount of local and national awards. One of them would be fantastic for your local business to win. It will take you up to 15 minutes of your time to complete a nomination for your favourite business or artist. Even if they do not get to be a winner or a finalist, being nominated is a big thing. Most of the awards give a special nomination badge to display on the businesses website and across social media. The nomination can attract an article in a local magazine or encourage other businesses to invest in them. All that from 15 minutes of your time! Below are some awards coming up in 2019. Other awards open during the year can be found in local and national magazines and papers. Social media is changing all the time. Trying to hide local business posts even if you have liked their page. Social media are trying to push small business into spending lots of money they do not have on advertising. By liking your favourite independent business' posts or better still commenting or sharing/ reposting, it will make that business more prominent. Now what are you waiting for? Go and support everyone. Community ceramicist. Passionate for the Arts to be accessible for everyone. Supportive of local businesses.